It is still possible, says Canning, a professor of economics and international health at Harvard University, for African countries to earn the “demographic dividend,” a phenomenon that occurs when shifts in age structure, from youthful to more mature, align with certain policies and boost economic productivity. National statistics and aggregate data suggest fertility is not changing much, but within Africa there is “enormous heterogeneity,” Canning says. For example, in Ethiopia, the fertility rate – number of children per woman – in the capital of Addis Ababa is below replacement rate (2.1), he says, while women in rural communities are having more than five children on average. His optimism stems from two trends. First, sub-Saharan Africa has successfully reduced child mortality over the last few decades, and lower child mortality often precedes lower fertility rates as parents feel more secure that their children will survive to adulthood, he points out. Second, Canning’s research with partners shows that female education plays a key role in lowering fertility rates. “Throughout Africa, women with higher levels of education are having very low fertility. There aren’t that many of those women yet, but actually education levels are going up,” Canning says, and the research shows “evidence that this effect is causal” by delaying marriage for many women. Once a demographic transition occurs, Canning says foreign direct investment in Africa will help absorb the subsequent youth bulge and provide jobs for young graduates in the early stages. Later, high levels of domestic savings will be key. “There is though the real prospect that some countries may be really successful and some [will] really fail in terms of this,” warns Canning. “Economic growth and economic success will lead to lower fertility, and that lower fertility leads to more success.” But slower transitions may also lead to political instability, if high rates of underemployment frustrate young populations. 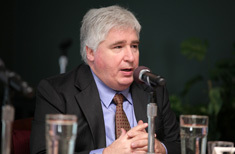 Canning spoke at the Wilson Center on October 15. Download his slides to follow along.